Round 2. Some of the U100 section in action. Jack Healings and Carl Mustafa test the reputation of table 13 - the top one for this section. Home bargains, whose sponsorship enabled me acquire an assistant, increase the number of sections and prizes per section, and provide framed certificates as mementoes to section winners. Alex Richardson, who helped John and myself set things out on Friday night, and Pete Shaw, Matthew Carr, James Rothwell and Abigail Sergeant who helped us return the building to normal after the event. The NSDCA, Alex Richardson, Simon and Edwards and Anon for their donations. 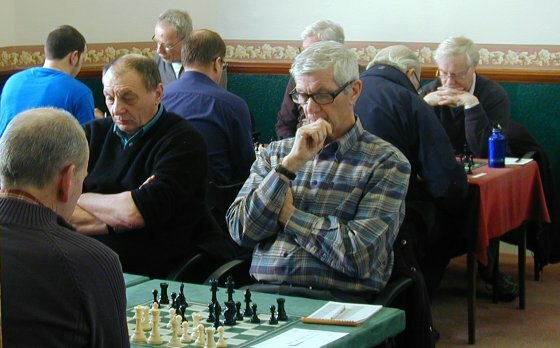 James Rothwell and John Day are enthralled by their round 3 game. Stuart Hull and Stuart Green face the camera in the foreground, where we can also see the back of Ernest Wilkinson. In the background are the U160 players, with Alan Paling making up the numbers.